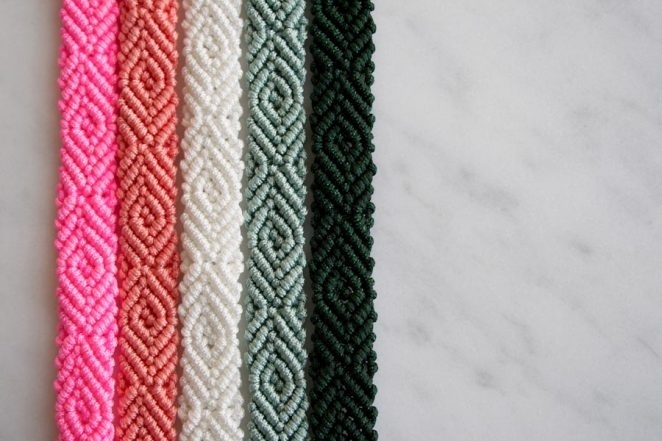 These Monochrome Friendship Bracelets borrow the diamond pattern from our Classic Friendship Bracelets and, quite literally, turn it upside down! 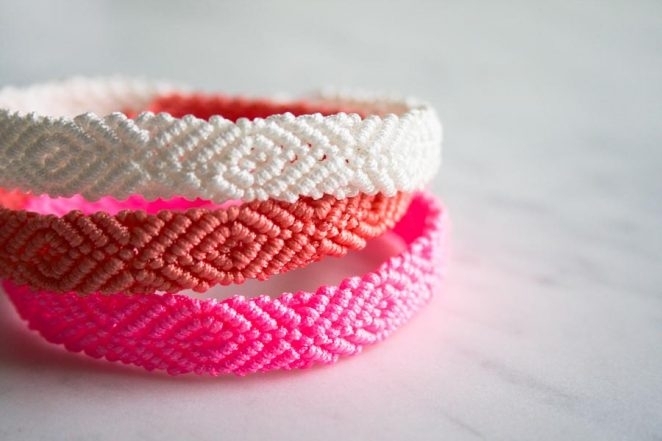 Using just one color of cording, you work up the diamond pattern, then flip it over to reveal a swirly pattern that intriguingly looks more like beading than macramé. 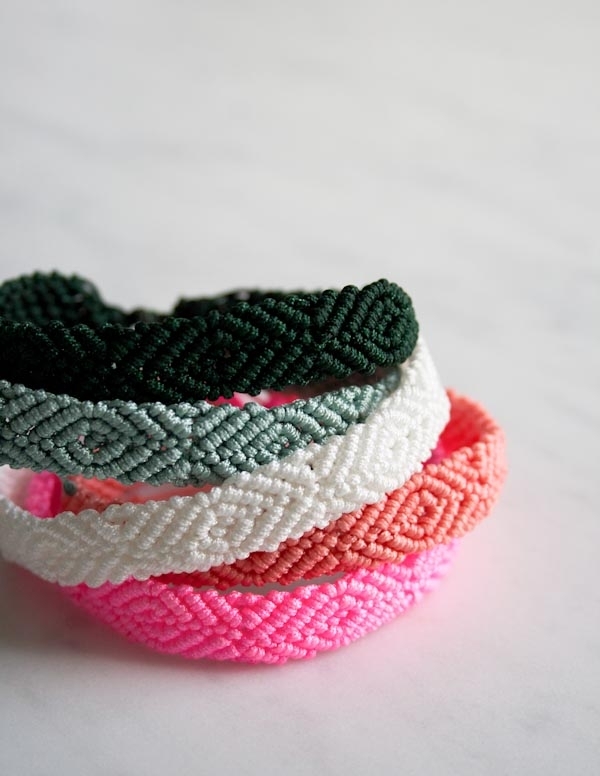 Who knew that the “wrong side” of a friendship bracelet contained such beauty? 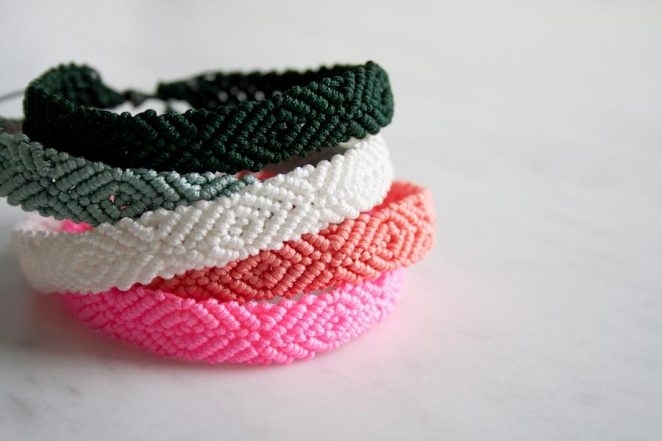 A Classic Friendship Bracelet Kit, which includes the Pattern and five spools of Knotting Cord, or just the Pattern on its own. 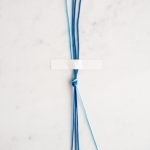 1mm Chinese Knotting Cord. One spool yields one bracelet. I used the colors Fluorescent Pink, Peach, Dark Green, Teal and White. 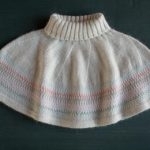 The original pattern calls for four colors (two strands of each color) and refers to the colors in the pattern as C1, C2, C3, and C4. 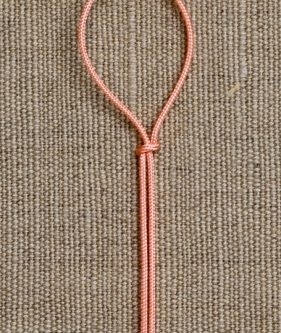 In the case of using one color, you should differentiate between each strand by tying small overhand knots at the end of each length of cord. 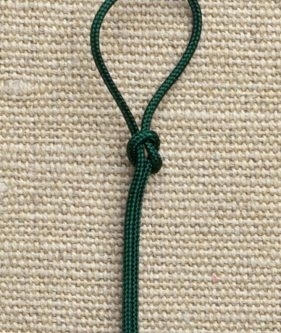 One knot for the cord that will be acting as Color 1 (C1), two for Color 2 (C2), etc. The above photo shows the ends of all of the cords before you begin, arranged in a mirror image (left to right): C4, C3, C2, C1, C1, C2, C3, C4. The side facing up as you are working looks like a smooth field of stitches, not like diamonds, so it’s really important that you keep track of which cord you are using and which step you are doing. This is a fairly advanced undertaking. 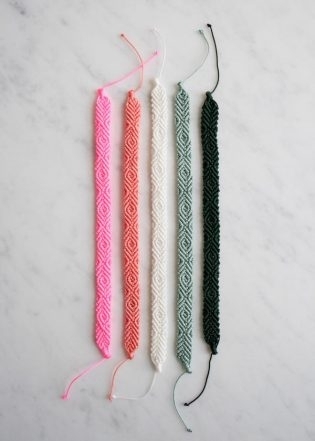 To get into the swing of it you may want to make a Diamond Bracelet with four colors before you make this version. Either way, enjoy the challenge! Camp crafts this year will rock it stylish! Could you share this tutorial with photos?? If you like this you will surely like the video on How To Make A Wish Bracelet on this site too! Those bracelets are beautiful also! I had a question, in the diamond friendship bracelet, it says to cut each color 72 inches and fold in half? 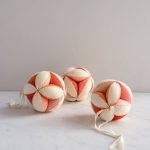 In this monochromatic post, is says one spool yields one bracelet. If the spools have 10 yds of cord, then my math isn’t adding up? How much of each Cord would I start with? Like for C1, C2, C3? Also when you say work up the diamond pattern, I’m confused? I thought I just have to follow the original pattern? Sorry for all these questions, but this bracelet looks so neat and I want to conquer it! 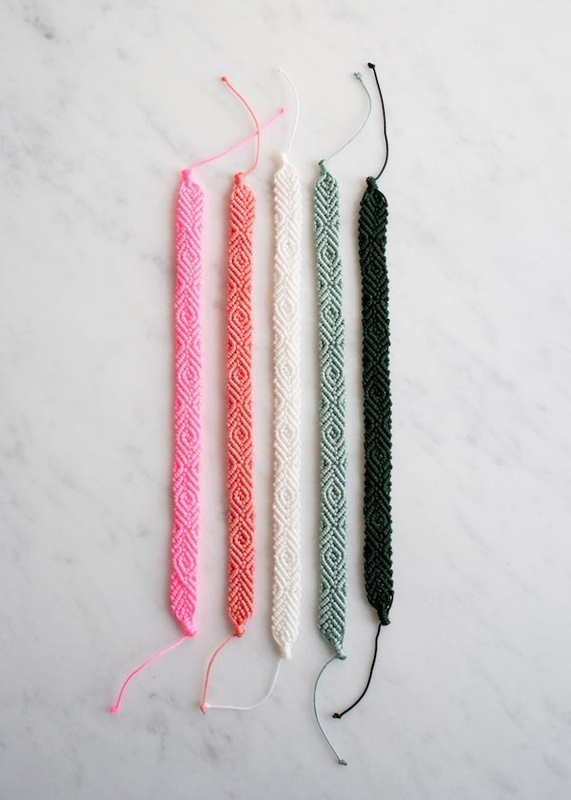 Begin by picking out 4 colors of cording and cut two 40-inch strands from each. 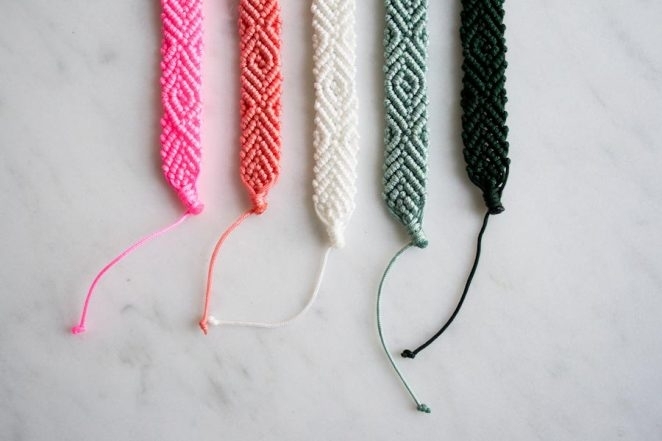 You can work this particular pattern only over 4 colors and 8 strands. 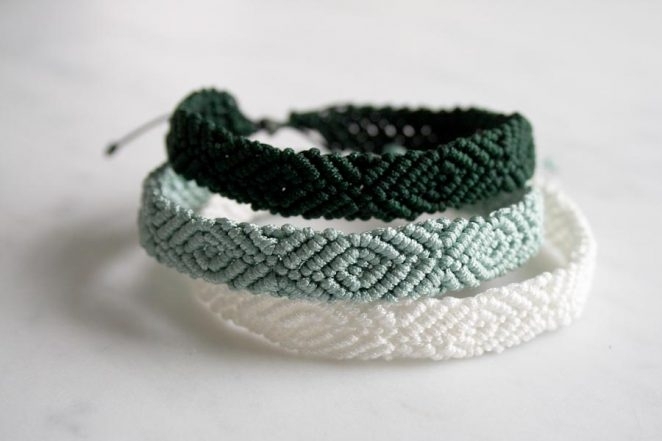 I’d like to do these monochromatic braccialets, where could I find the tutorial. 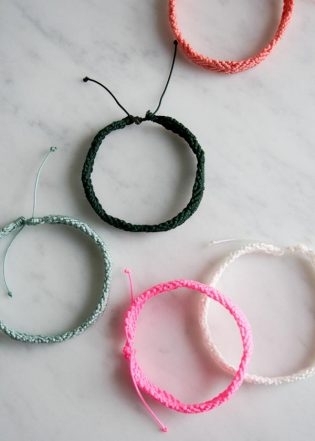 Hi i want to make this bracelet but I can’t figure out how to end it since it looks so different compared to the one you guys had an article about Could you make another tutorial?? Thanks for writing in and thank you for your request! 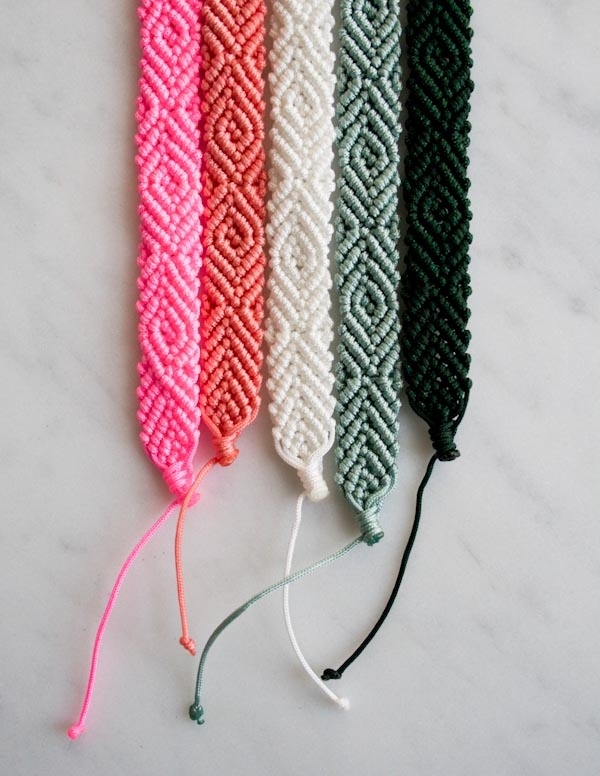 The directions for this bracelet can be found in our Classic Friendship Bracelet pattern that is available for purchase! 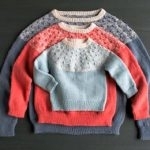 reading the other comments, I guess it’s confusing to tag this post as “free craft pattern”. Thank you for notifying us! We were not aware and now have edited the post. I’ve just made one of these bracelets and I absolutely love it! 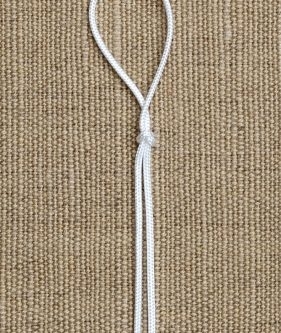 In addition to 1mm knotting cord I also have .4mm knotting cord. 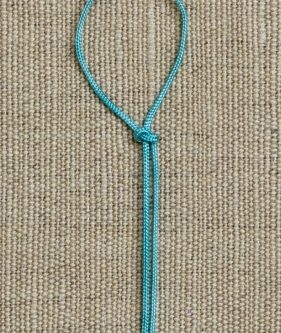 Do you have any idea how I should adjust the length of the strands to make this? Thank you for writing in! 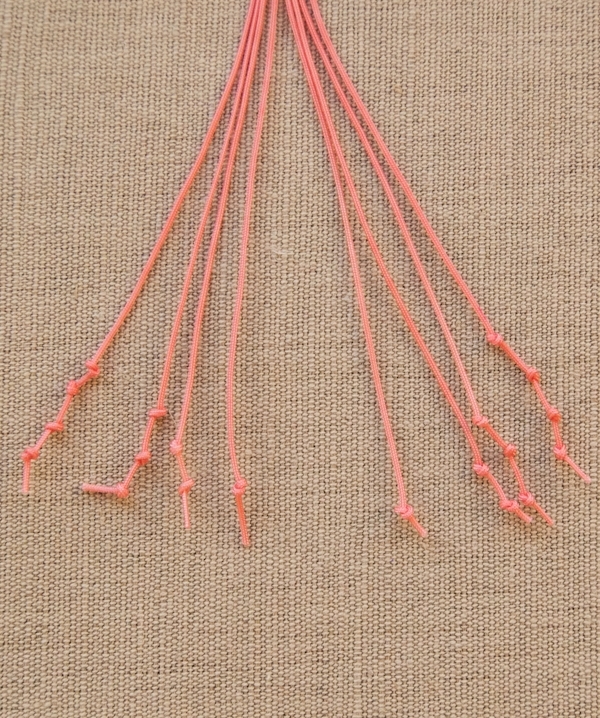 While you may be tempted to make the strands shorter, I would suggest making them a similar length or a bit longer. 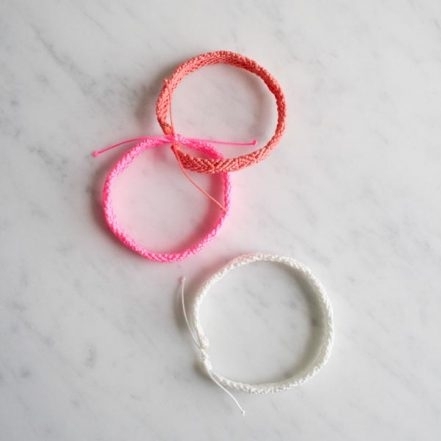 Even though the knits will take up less cording, you will need to complete more rows to create the same length bracelet. Hello! I was wondering if you thought this craft would be age appropriate for an 8 yr old? Thank you for your question! I would say a crafty 8 year old could handle this with adult help. 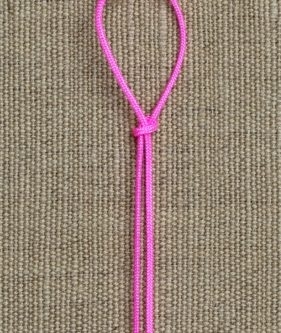 Have you ever finished a friendship bracelet with a jump ring and lobster clasp? If so, is there a tutorial? Thanks for writing in! 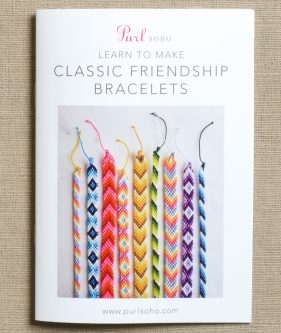 We have not used a jump ring or lobster clasp to finish friendship bracelets and thus do not have tutorial. It does sound like a good idea. You may be able to find some help if it has been tried by searching on YouTube!